3B Umpire Hunter Wendelstedt ejected Cubs Manager Joe Maddon for arguing a Replay Review decision that affirmed 1B Umpire David Rackley's safe call in the bottom of the 3rd inning of the Cubs-Brewers game. With two out and one on, Brewers batter Adam Lind hit a 1-2 fastball from Cubs pitcher Clayton Richard on the ground to shortstop Starlin Castro, who threw to first baseman Anthony Rizzo as Lind arrived at first base, ruled safe by Rackley. Upon Replay Review as the result of a challenge by Cubs Manager Maddon, Rackley's ruling was confirmed (pulled foot), the call was irrecusable. At the time of the ejection, the Cubs were leading, 2-1. The Cubs ultimately won the contest, 4-3. This is Hunter Wendelstedt (21)'s third ejection of 2015. Hunter Wendelstedt now has 12 points in the UEFL Standings (10 Previous + 2 MLB + 0 Irrecusable = 12). Crew Chief Hunter Wendelstedt now has 9 points in Crew Division (8 Previous + 1 Irrecusable Call = 9). This is the 151st ejection of the 2015 MLB Regular Season. This is the 68th Manager ejection of 2015. This is the Cubs' 6th ejection of 2015, 3rd in the NL Central (CIN, PIT 7; CHC 6; MIL, STL 5). 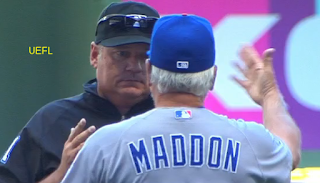 This is Joe Maddon's 4th ejection of 2015, 1st since July 22 (Adam Hamari; QOC = Y [Balk]). This is Hunter Wendelstedt's first ejection since July 22 (Bob Melvin; QOC = Y [Balls/Strikes]).